Althals said: "I often try to imagine what Gevlon's apartment would look like if he truly followed all the things he says here. The living room has a desk with his computer with a decent chair. Maybe a TV on a small stand, and nothing else. How do you justify luxury items in your own life when you pound on them in WOW terms? A vanity pet is exactly that, vanity something someone wants. You call it a waste." My living room is even worse than you could imagine. There are two 1.6x0.9m (5x3ft) office-desks (from the local office outlet) at the wall by each other, with the two monitors (21' and 19'), keyboards, speakers and mice. At the opposite of my desk there is our double bed where we use to watch DVD (on my computer screen) and also sleep. Next to it a big empty space with a carpet (often covered by clothes, bags and other things waiting for the week's big cleaning). The closets with our clothes and stuff are in another room that we just call "the warehouse". It's really a mess, but no one cares as we are never there for more than minutes to pick up stuff. Do our visitors like it? We couldn't care less. It's our home, we live the way we want. The home serve us well for less than 3-4 hours/week housework. Vanity: stuff you don't use, but work for hours to get, just to look cool. BTW the first thing we bought when we got together (yet we did not have much money) was a dishwasher. No one likes to grind the dirty dishes. Although I wrote it several times, commenters keep asking why am I against the bike/mammoth. Simple: it's useless and costs money = time. I make 3-4K G/hour. So buying a mammoth would take 5-6 hours from my life. Could I do it? Of course I could, just like I could wash the dishes with my hand. I just don't want to. Time is a limited resource. You are mortal, you have just X hours before you die. Don't make it X-5 just to have a completely useless thing! If you make less than me (and it's quite possible), then it's even worse. For someone who makes only 1K/hour, the Mammoth costs 18 hours. Does that thing worth it? Or rather: is your time is so worthless? Bagmaker wrote that "If the mammoth cost 2 copper surely you could justify buying it; the question is whether the (opportunity) cost of the (gold you spend to buy) the mammoth is worth the utility you gain from it". Completely true. The problem is that the Mammoth is so expensive that time won by it would never be equal to time spent, even with my G/hour. Any other "utility" is vanity as it does not have teaching or challenge value. Others suggested that the Mammoth worth for the "fun" it gives. That's nonsense. Activities can be fun. Raiding, arena, BG, questing can be fun. Items cannot be fun. Items are tools for activities. For example without high level arena gear, arena PvP is not fun but "being ganked". But itself the gear is not fun. We shall ask what kind of activities need a Mammoth? I know two: blocking objects and standing front of the Dalaran bank to let others see how rich you are. So one can say "The Mammoth worth its price because I have so much fun blocking the fountain". That can be true. But then say this. (and don't be suprised if you are not perceived awesome). I'm just thinking : isn't playing WoW useless too ? I recall an earlier post of yours, something along the lines of "why should you believe anything I say here?" Playing MMOs should be the last thing you spend your time doing if you were worried about wasting few precious hours of your life. Those fans must be noisy. Go one step further, put the pcs in the refrigerator. for how much g would you buy the mammoth? and gl with your flat. I wouldn't put a pc in the refrigerator of course. Condense is bad, mkay? vanity items are indeed tricky. Your idea about "using so many hours to be able buy it"-strategy is exactly what I use for almost everything I buy. Say taking a cab costs €30, cycling... uhm, €0. But with the cab it takes only 15 mins, while cycling takes an hour. That means that I lose 45 mins when cycling. Then it all depends whether I would earn more than €30 euros in 45 mins, to determine if it is more logical to take a cab. And it also indeed works the other way around determining how long it takes me to earn back something I buy. And playing MMO is actually very cost effective. You can entertain yourself a lot of hours for a very small amount. I also swear or laugh at people saying they don't like the monthly fee to play and then go out to the cinema or something else, which costs almost the same and gives only 2-3 hours of entertainment. There is a difference imo, between time spend on relaxing/entertainment and time lost in for example transport or waiting time. I'm fairly certain that's a pretty inefficient way of cooling them, you risk a lot of dust getting inside your box and mucking stuff up and instead of having a straight line of airflow like you would with proper in case fans you create a swirling vortex in your PC. Heck you could even argue it gives you leadership and social skills. And a sense of control and accomplishment. The argument here is that the "fun" the mammoth brings is not worth the effort. It's true for Gevlon, it's not for others. The mammoth is a gold sink, nothing else. If someone in the raid has a mammoth out already, whats the point of others getting on theirs. Unless its a competition to see who gets theirs out the quickest. Pointless waste of gold if you ask me. Items can be fun. Having a cute little minipet such as the bunny out makes waiting between pulls a bit more fun. The activity here would be watching your cute little pet! Reader from France wrote that "WoW has a use: Fun"
If that's the case, a mammoth or vanity pets can be justified with the same excuse. If not, you will be contradicting yourself (as Gevlon does all the time). Hmm... do I see the average WoW player logic here? The mammoth that drops from Vault blocks things just as well as the expensive one and is free. "Heck you could even argue it gives you leadership and social skills. And a sense of control and accomplishment." You're so right. One of the most important things I've learned from WoW, is the value of small numbers (in large amounts). Although I did know this already, I never truly realised how immense that value actually is! When when I started this game I used to not loot grey items while playing, I used to think the difference enchants made was rediculously low compared to the cost. Just 2% damage increase from a talent point? Seemed insignificant. On AH I focussed on the more expensive items, because 30g profit over an item that cost me 70g to get seemed so much better then 2g profit on an item that cost me 8g to get, even when it sold in an instant. Exactly the same things applied to real life for me: the small difference in fuel price from fuelstations seemed insignificant, the few cents I won by buying groceries from cheaper brands, lunch at the cafeteria@work costs 4eu on average. Seemed little. If I make it myself it's 1. 3*20 is about 60 euro's a month. I now realise the true importance and I'm saving tons. It is even becomming a sport for me to save money now. Hence my last two sentence : "The argument here is that the "fun" the mammoth brings is not worth the effort. It's true for Gevlon, it's not for others." The mammoth is worth the money for saving the time spent travelling back and forth to a vendor while levelling. I am never, never going to level again without my own portable vendor. I think the perfect game for you would be Darkfall. You can try the beta if you want. The game just have no limitatons and im sure no gold cap =p. I really don't consider the mammoth with vendors to be a luxury item. Does anyone really think that Blizzard is going to let you use your flying mount in the next expansion. You will be stuck doing ten more levels on a ground mount. It is much easier to hop on your mammoth and clear bag space by selling vendor stuff than to hoof it all the way back to town. So if you bought a Traveler's Tundra Mammoth at 74, then by the time you are 90 I would imagine it would pay for itself. You can do drive bys with the mammoth in neutral cities. It's really fun! Whatsmymain wins. That's the reason you shouldn't have the mammoth - if you're a raider or PvPer, there are much more important things to buy. The mammoth and the bike are for casuals - they're great for farming or helping people quest, but are expensive for minimal raid utility*. If you're running a buddy's alt pre-60, the bike is great. If you're farming and not an engineer, you can drop vendor trash easily**. If you're not a raider or arena-junkie, then all you're using WoW for is a platform to hang out. In that case, why can't having a mammoth be a goal? I think the bottom line is that if someone's having fun and isn't interfering with your fun, live and let live. If they're honestly enjoying the time spent, then they're weird - but that's fine. I completely agree, however, that you are free to refuse to help those people, and you're free to not raid with them if their pursuit of "toys" keeps them from being a responsible raider. * - mammoth is nice if you have no engineers in the raid. **-not that you're gonna make your 20k back doing that, but whatever. I don't have a problem with the mammoth exactly, the problem I have with buying it, is that odds are very high that there will be more such mounts available at least by the next expansion. Odds are also high that one will come out that will be more visually desireable than Mister Mammoth. Now if I spent over 10k ok the mammoth and then there was similar mount that I thought much more visually appealling, I would hate myself for spending all that money on the mammoth. For that much money, I want something that I know I will treasure forever. I mean, my green proto drake is way better than a mammoth and it was almost free. It flies, it looks better......... For over 10k, a mount should be the coolest damn thing you ever saw, and ever will see. Even then, there would be an argument that it was practically useless. Well, I do believe that something visually appealing and unique is worth something. Just not that much. I bought my Mammoth for the services it offers but also to obtain the 100 mounts achievement (one that requires a lot of time, money and effort). The Mammoth can repair my own and the entire raids gear (which was used a lot before the repair vendors were fixed in Ulduar and inside OS/EoE 25), it has backup arrows and other useful materials (and reagents) and since I own 2 World of Warcraft accounts it also allows me to save a lot of time when leveling other characters from 1 to 60 (and once again, it also allows me to clean my bags and repair during that time). Running back and forth through Azeroth can be very time consuming and the Mammoth has saved me a lot of time with this. In the first few months of Wrath of the Lich King this Mammoth and similar vehicle mounts were able to ignore falling damage and there were a few other issues with them which made them quite fun (or useful) to play with (+30% moving speed with Aspect of the Pack for example). There is still an issue with the Mammoth (not with the hog though) which allows players that are in combat to jump on it what can be a lot of fun in PVP. In addition the mammoth offers Northrend reagents in Orgrimmar and similar cities which can also be very helpfull while leveling professions (relogging, traveling or calculating how many reagents you need can be very time/money consuming unless you are a Mage). omg, that picture is hilarious. In addition to my previous post, if you can save 25 raid members 20 minutes (hearthstoning, buying reagents / ammo / repairing / etc) of their time that's 500 minutes (8,3 hours) saved in one evening. while i agree with your opinion, i'd still like to add 1 more usability of the mammoth ( if used correctly ). 3) it allows for quicker repair with raids, especialy with progress/hard mode raids. ( it's quicker to have 1 person with a mammoth with repair, then to have an entire raidgroup having to go to a repair ). but still it's quite situational and mostly not needed. Since you res at Naxx in a village and there is a goblin on an ogre in Ulduar, the "Mammoth can repair" is a very bad justification. If someone runs out of reagents during a raid, he needs -DKP, not mammoth. I have the mammoth for precisely the reason Shy stated. As I begin to level through the next expansion I will have my portable vendor and repairs from my mammoth along with the Bank Squire from the Tournament reward I will basically only ever have to return to a city for training. I'm not an engineer so I don't have access to the portable mailbox but I figure that while levelling I should come across a mailbox while getting/turning in quests often enough that I can off-load any items I don't want to sell or throw in my bank. If you're so worried about money there would be the question of why you're playing the game and not, say, working. For example, I love sci-fi, so I love being an engineer and I plan to buy a motorcycle sometime soon just because I enjoy driving around on a motorcycle. It will increase my enjoyment of the game every moment I'm mounted. Sounds like a decent trade off to me. If you really wanted to save money you could stop paying your way into a guild and just wait until everyone is in T10 and hardmode steelbreaker is easy. Sounds like the way to do it based on your philosophies. At some point we have to pay for our enjoyment. Also, sometimes I like doing the dishes. It's relaxing. The traveler's tundra mammoth is a gold sink. However, I have used the other mammoth (Grand Ice Mammoth) for fun. It's a very good way to do the fire festival and I took my GF's little toon, and one other guildie, to all the ones in Azeroth. It's also cheaper than either the Traveler's Tundra or the motorbike. And for what it's worth, it's a heck of a lot more fun trying to get a lvl 20 toon to Ungoro without being eaten than it is just doing them solo on your level 80. Replace those ludicrous fans with decent PC fans. You will save a lot of energy, it will be a lot less noisy and it will look a lot better. All for the cost of maybe 20$ in fans (which should get you 4+ good fans). I can also make a (tiny) point for the mammoth: If ONE person in a guild has it, the whole guild can repair after whipes nearly anywhere, saving time. That would have been an issue with AQ or Naxx(60), but Ulduar has its private repairman, making it superflous. Like most other people I don't pay to play in a raiding guild , I applied , got accepted and do a very good job. Therefore I'm saving 5000g / week. Mammoth costs 16,000g and lasts forever , your raiding costs 20k/g a month. All they talk about always bringing consumables to raids is flawed , Blizzard have stated numerous times they designed WotLK to not require everyone to use consumables. Rated purely on a time basis, the Mammoth has more than paid for itself by reducing the amount of time my raids waste on running back to town for repairs or resupplies. It's knocked far more non-productive time off of our raids than it ever did cost to buy it. Selling items back to the vendor has paid back a third of it's purchase price, and being able to repair and restock in the field has saved hours which probably paid for the rest (not to mention avoiding all falling damage for a few months). As an investment for farming and raid support, it's been profitable in the long run. I'm sorry but the traveler's tundra mammoth is nice if you have friends you group with. Its too bad it doesn't haul more. And if only there were a flying version. The non-vehicle mounts that don't take passengers are useless fluff though. I once thought as you do. My freshman year room in college was bare of all of all frivolous items, just my bike, dresser, my computer on a desk, and my bed. Wires and stuff everywhere--rather similar to what you describe. A friend of mine convinced me to take a test the next year. While I was lying in bed, he took my heart rate, breathing rate, and blood pressure. We then took a Saturday and went shopping for my new room. I picked out a nice-looking tapestry, bought a picture of my favorite mountain, a painting, and a nice fuzzy armchair. With all these installed, my resting heart rate was 11% lower, my breathing rate was 7% lower, and my blood pressure was 15% lower. More than that, I felt much more comfortable in my room--I had made it my home. Time and money well spent, IMHO. You never know about the mammoth. My wife put countless hours of questing into buying one. Not to show it off or block mailboxes, but because of pure whimsy. She enjoys it, finds it to be fun, pure and simple. She gets a kick out of our being able to ride it together. She likes being able to provide others a repair bot. Mostly, she has an ongoing love for everything related to elephants in the game, that started when she rolled a gnome who was going to ride an elephant. Her many days of grinding reputation to get an elekk at 60? It was fun for her. It wouldn't be fun for me. It wouldn't be fun for you. But who are we to tell others what is fun? Only after the mammoth did she save the money for swift flight. Now that I think of it, while you are right that we have only so many hours before we die, my wife spends a lot less hours on WoW than I do and didn't put in extra hours to get her mammoth. She just prioritized her money, spending it only on essentials and the mammoth, and with her limited time online, she was either raiding or doing quests to get mammoth money. She would not have spent fewer hours if she'd done something else in WoW, she'd just have... done something else. She did what was fun for her, which usually isn't more than a few quests a day. Gevlin, I too am a minimalist when it comes household furniture and fixtures (having moved a lot in my late teens/early 20s destroyed the horder in me) and do my best to keep clutter out of my life. However, I agree 100% with Russell's comment. A well chosen and cheap picture, bought from any major department stores, can make a huge sub-conscious difference to the feeling of a room. Green especially has been proven to be a calming colour. If you are in a small apartment, all you need are 1 or 2 items to really make a difference, especially if the paint scheme is white/neutral. And are you overclocking or something? Why do youo need such big cooling fans? You already spend much of your time wasted in a virtual world, working towards virtual gear, etc and paying REAL money to do it. You're the very definition of hypocrite. You want to know why you're mocked and judged so often? Your harsh judgments of others for doing what they consider fun. My wife and I both play WoW. We play for very different reasons and understand that what makes the game fun for one person may not be the same for others. She likes collecting pets. I like raiding for loot. My best friend likes to level alts. All very valid reasons to enjoy a vast game as large as WoW. Too bad you're so far stuck in your own little world to see it. I can't remember what kind of engineer you are, Gevlon. 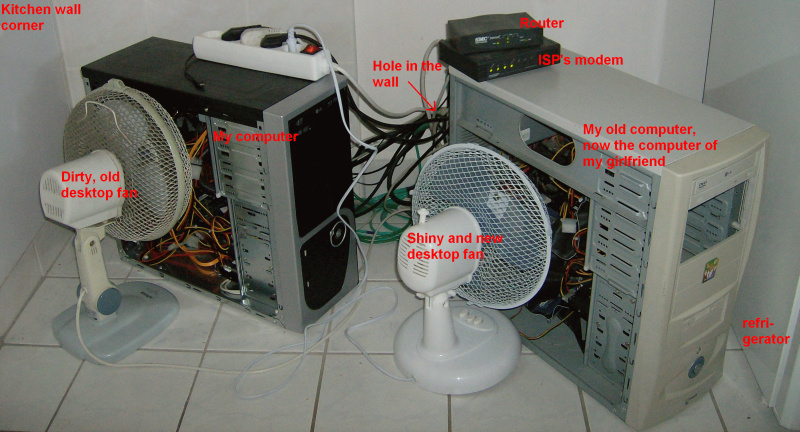 But, if you ever studied fluidodynamics, you can easily suspect that a fan pointed towards the open chassis (and, generally speaking, the open chassis) it's one of the most unefficent way to cool your computer. I like farming the AH. I am nowhere near as efficient as you though, it results in 1.5k-2k gold an hour usually. I however value these items. For some reason I like repetitive grinds if they are a part of old school content. I just do them, when I am not doing arena. I re-rolled engineering to support this (portable mailbox) I have saved over 6 hours of traveling. This could have resulted in 12k g, while it did cost me 4k gold to level (I most likely just have gotten 6k gold by saved time and another 2k by selling unique items). My Mammoth could be a slightly more debatable purchase. I do think that the opportunity cost would have been quite high if I would not have bought it. You are forgetting one thing. The mammoth is not a vanity item, it is a functional luxury item. I have only gotten 2k by selling BoP greens so far, which would be more throughout the whole expansion. I am expecting the cost to be around 10k (It is not worth time wise to go to the vendor for grays/greens when doing old instances, so i would delete them. Now i can sell them. This does not count for the time lost going to reagent vendors.). What does it provide me? I have less bag space problems when playing. Full 22 slotters just are not enough, even when combining it with a guild bank with 4 slots and 6 craft/bank alts. I can now loot items whenever I feel like it. I never have to worry about buying reagents in advance again. I do not have to buy drinks before doing BG's. This is worth the 10k for me (I have no other function for all the gold lying around). It is not worth it for you, due to spending your time differently in game. You seem to play a lot less than me. Note: I do not use it as a mount, i use my first mount for traveling. It is too big to be functional. So Gevlon, you have huge sums of gold. How useless is that! 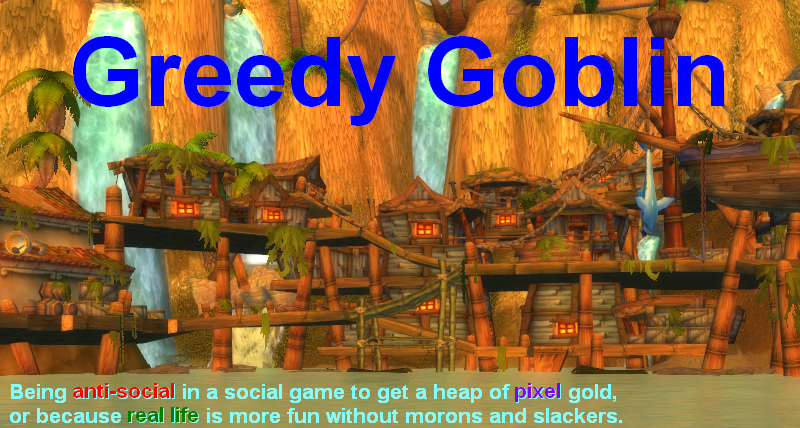 With the fun activities as you stated (questing, raiding, BG’s, etc) and the occasional herb gathering on my way to those activities I earn enough money for repairs, buff food, enchants, gems and glyphs. Gear upgrades I get from the fun activities. I do not spend hours earning money I have no need for other than to boost about on a blog, nor for the sake of reaching gold cap. So...you have around 50 hours just sitting on your character as a row of numbers. How is this a better use of your time than buying items with that money? At least I can ride my 6 hours around and transport a low level character with me. (I have a bike) I have used the bike to help my wife get her low level alt around the world saving her a lot of time and me a lot of headache. Or I could have 12,000 more gold that is just sitting in my bank. I work under a different model. I maintain a balance. I keep at least 10K on my bank at all times. I need this as operating costs and emergency funds. I tend to stay at 16-20K most times. I contend that hoarding all that gold does you no good. All you have is more numbers than I do. We can open a trade window and you can show me a large number. the ultimate question is this - what is the point of having money if you do not spend it? Why are your numbers better than my mammoth? You use your numbers for nothing, the mammoth is out in the world. Hell, even Hank Rearden bought a fancy car. I wouldn't buy the mammoth because I don't happen to like the way it looks. I grinded troll rep on my orc shaman because I wanted to buy the raptor mounts (which have nicer colors than the PvP mount, which I also have). When it comes to games, I prioritize very differently than I do my life outside of the games. After all, the time I spend in the game is, by definition, leisure time. If I spend it on cutting edge content or grinding gold so I can ride an elephant, it's all the same to me. The mammoth is horribly ugly and wobbly. Most people buy it for the repair and vendor feature, which I must say has been quite useful on many different raids. On Sarth 3D in particular the mammoth was used quite a bit--it's a convenient raid repair bot that doesn't put one at risk of encountering hostile players. If Ulduar had no ogre (and for the first few weeks he despawned), the mammoth would have a second glory day. Now, if they'd only put a vendor on the motorcycle life would be complete. I would agree with the comments that the mammoth is basically a 16k gold trash vendor. I am not certain that it is worth it, but on the other hand, I am almost always short of inventory space whenever I go back to an old world instance. This alone makes me think the mammoth may be worth it. But no, I would probably never purchase it for the looks alone. I like my mammoth - on the basis that...I've bought everything else I want...and the time saved in pug raids is a benefit. The motorcycle needs something now that you can't jump unlimited distances on it. 12.5 k for a passenger? C'mon now Blizzard, Give it a speed booster or something. And the mammoth is ugly unless you're a tauren or orc warrior or shaman. Then you can justify the prehistoric savage look. I think a lot of people have a lack what you are trying to say and correct me if I am wrong. You play WOW a certain way and your way. If you do not want to waste 5-6 hours for some little vanity thing in a game, that makes sense. I think it is the same arguement against those who complain how WOW is so much easier then before. I am paying real, actual money to a company to get enjoyment out of a game. Same as you. If you enjoy making donzens of characters, making loads of cash, or raiding wee hours of the night...all different ways to enjoy it, and you want to maximize your way of enjoying the game and wasting "hard" work (real time) for a useless item makes perfect sense. I personally love being able to log on and do dungeons at 30-45mins, instead of hours on end like old BRD or Strat and such. I think Strat/Scholo in the day I ran them (10mans) still took an hour and a half roughly. Now not that I want free epics, or everything easy mode. I have no problem with hard content being hard and raiders doing what they do....and after a "year" catching up to them in content. To each his own, I don't find enjoyment in spending hours on end for a dungeon. I'd be interested if and how you have found ways to succeed in the real world (milking the morons) as you have ingame.